Form up Squid Kids, it’s nearly time to build squads and play without those horrible strangers. Two new matchmaking modes arrive in Splatoon on August 5, plus 30 more player levels, more than 40 pieces of gear and a pair of new weapons. Squad Battles allow for organized groups of friends to form up into teams of two or four to play together against other teams in Ranked Mode. 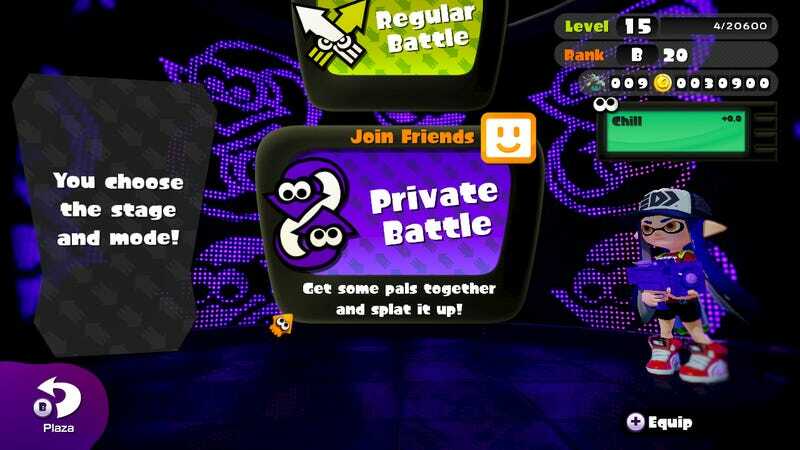 I’m much more excited about the Private Battle, in which players can create custom matches between friends. Pick a map, select teams—1v1 to 4v4—and start drawing dicks uninterrupted strangers. The teams can even be uneven, so if you just want one player on the other side—say for shading purposes—while the rest handle drawing duties, it can be done. Sure, some people will use it for normal play between friends, but the creative types are going to create such beautiful horrors. I can’t wait. All this while folks playing the regular modes are busy leveling from 20 to 50 and collecting new articles of clothing, like a sushi chef uniform, which doesn’t seem cruel at all. All this while learning to wield the new bucket-like Slosher weapon and the Splatling Gun, which sounds beautiful. All of this mayhem arrives on August 5, but it’s not the end—Nintendo has updates—including new weapons, modes and maps—planned through through fall. It’s a good time to be a squid. Or a kid. Or a squid. Or a kid.